It is the silence that you notice first. Not just a lack of noise but an absence of sounds. Even the birds have left. I am in Telskuf, Iraq, about 20 miles north of the Islamic State (ISIS) stronghold of Mosul and a mile and-a-half from the front line. The town is abandoned; its inhabitants, including approximately 12,000 Christians, fled the advance of ISIS militias during the night of August 6, 2014, finding refuge in the nearby city of Alqosh or in the Kurdish capital Erbil. Under a blazing sun, we press against the shadow of abandoned shells: houses with gaping mouths, pockmarked walls fronted by the husks of blackened cars betraying the brutality which took place just a few weeks prior. 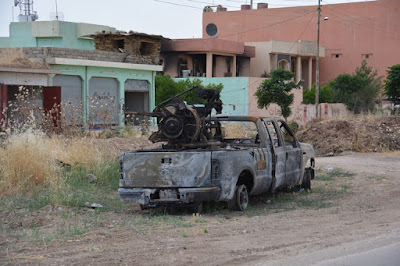 On May 3, 2016, hundreds of ISIS fighters, multiple car bombs and suicide bombers broke through Kurdish lines before a counterattack supported by US airstrikes turned ISIS back. Casualties included three Kurdish fighters and a 31-year-old US Special Forces soldier. According to unconfirmed reports by Peshmerga soldiers, more than 50 ISIS soldiers were killed. They were photographed and then bulldozed into a roadside grave. The earth is still fresh. I am walking through the town as part of a delegation from the Catholic charity Aid to the Church in Need (ACN). We have come in a visit of solidarity to the Christian town of Alqosh. Roughly 10 miles from Telskuf, Alqosh is the last remaining major Christian city on the Plain of Nineveh in what once was a valley full of Christian villages—the great majority of them since occupied and destroyed by ISIS. It’s there that the Chaldean Catholic Bishop Mikha Pola Maqdassi has organized support for the more than 500 displaced families in addition to the village's existing 1200 families. All are seeking work where there is none. The Catholic Church is the main provider of social care and, above all, hope. As Bishop Maqdassi explains, the youth are discouraged, finding themselves in a world that is wasted. We make our way to Telskuf's Catholic Church. Again the silence is broken only by broken glass underfoot. The church has been looted and destroyed. The statue of the Virgin Mary has been desecrated, the head cut from her body—the symbol of beheading the signature of ISIS. The Peshmerga soldiers with reflective sunglasses and guns cradled take positions at key vantage points: the dome, broken windows, the bell tower, all to assure our security. We kneel to pray in what was the choir loft. Led by Father Andrew Halemba, who oversees ACN’s Middle East projects, we pray the Lord's Prayer for peace, our normally easygoing and cheerful group shocked and silenced. A Christian general, a generous man with graying temples waits respectfully and when we are finished implores us to join him for a meal. Although time doesn't allow for many stories, he tells us that he fights ISIS so that those who live in the remaining Christian villages in the region may be protected. We walk back through overturned streets. I wonder when the birds will come back.